Scientists once assumed that giraffes – the tallest terrestrial animals on Earth – basically did without sleep, but these eccentric-looking, skyscraping African ungulates do indeed catch some shut-eye, though in mighty brief increments that we humans would find maddening. The brevity of giraffe sleep, which may take place standing or lying down, likely has to do with two fundamental factors of the long-necked browser’s life: rumination and predation. A study of the sleeping patterns of captive giraffes at a zoo in the Netherlands observed three kinds of sleep: standing, recumbent and paradoxical, which is another name for rapid eye movement (REM) sleep. Standing sleep saw a giraffe erect but motionless with its neck tilted a bit more forward than while walking; the researchers hypothesized this was probably a form of light napping. In recumbent sleep, giraffes lay down with legs folded and neck leaning. The classic giraffe pose of paradoxical or deep sleep has the beast lying down with its neck arched backward and its head resting on its hindquarters or the ground – a stance that's been compared to a sleeping swan. Giraffe siestas tend to last no more than a few minutes at a time. In the zoo giraffes studied in Netherlands, 24 percent of REM-sleep episodes lasted less than a minute. That's deep sleep, mind you. As ruminants, giraffes spend long periods chewing their cud, and it’s possible they sometimes doze lightly while doing so. The study suggested giraffes caught an average total of 4.6 hours of winks per 24-hour cycle. Newborn calves may sleep more: One under observation in the Buffalo Zoological Garden in a 1978 study spent about a quarter of its time asleep, mostly in a deep-sleep swan pose. In "The Behavior Guide to African Mammals," zoologist Richard D. Estes notes that wild giraffes typically spend part of the night lying down, alternating this repose – which peaks in early morning – with periods of browsing or standing rumination. When the moon is bright, the animals spend more time feeding and less time ruminating or reclining. 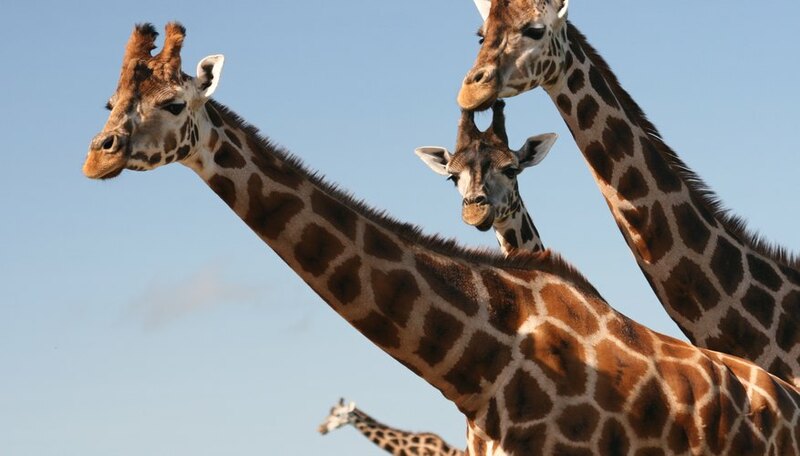 Female giraffes tending offspring have their own nocturnal routine: Young calves lie hidden, trying to stay under the radar of predators, and their mothers stand alertly on guard in the vicinity. Why do giraffes sleep only a few hours of every day? Part of the reason may be to avoid predation. On the whole, adult giraffes don’t have to worr_y_ much about predators because of their sheer size and formidable hooves. However, lying down and getting up is an awkward, somewhat protracted process for these gangly beasts, and a recumbent, sacked-out giraffe is therefore vulnerable to lions, which have a better chance in this situation of seizing the ungulate’s head and throttling it. Favoring catnaps instead of hitting the hay for hours at a time may have much to do with the giraffe’s diet. Rumination requires the giraffe to bring up partially digested food – the cud – from a specialized stomach chamber (the rumen) and chew it to further break it down. This ruminating takes up a goodly portion of the giraffe’s day on top of active feeding, which itself may occupy as much as 75 percent of the herbivore's time depending on the season. Given these constraints, deep sleep becomes a peripheral, on-the-side activity pursued in short spells. Shaw, Ethan. "How Do Giraffes Sleep?" Sciencing, https://sciencing.com/giraffes-sleep-4565890.html. 13 March 2018.